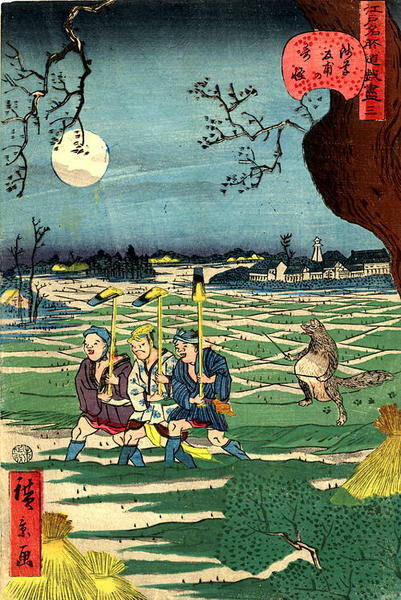 [Go Back] [New Search] Details for Hirokage, Utagawa (c.1859) "The Badger"
Format: Oban yoko-e: 9.5" x 14.5"
Subject: Three Peasant labourers are mimicked by a Badger as they return home at evening under a full moon. Condition: Good colors. Trimmed to image. Thin Japanese album backing paper. Minor marks and flaws. Generally good state of preservation. Impression: Good impression with mica in the bokashi at top.